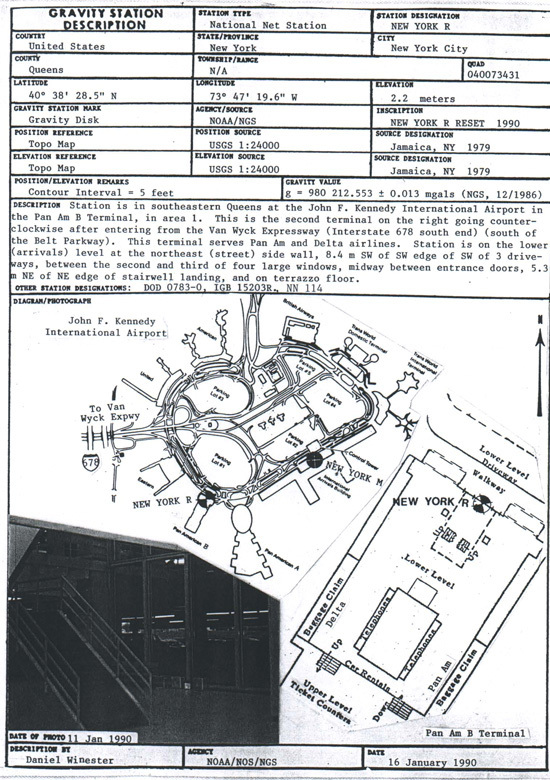 When I first stumbled upon these poorly scanned data sheets of so-called gravity base stations, I thought they were actual “stations,” that is, actual gravity sensing devices that are constantly taking measurements of local geodetic conditions. Compact machines like those humidity monitors you see in museums and galleries that are sometimes mistaken for art installations. To protect them from the environment and public tampering, I imagined each device encased in a metal canister, permanently embedded in concrete or stone and topped with a benchmark disk, itself stamped with an identification number and a warning of a fine or imprisonment to anyone who disturbs them. I also imagined them forming a pointillist sensor network, just another sedimentary layer of a much more totalizing enviro-veillance network superimposed on the surface of the earth. Deployed in the most unassuming corners of the built environment, they pique little interest outside the insular worlds of geologists and geocachers. But I was giddy with the possibility that they might be like buoy stations set adrift by NOAA not in the open ocean but on “solid” ground. Instead of ocean waves, they surf on invisible gravitational swells and troughs. And instead of the hyperactivities of the weather, they monitor something beyond our lived experience and even beyond their operational lives: gravitational fluxes caused by the million- or billion-year-long gyrations of tectonic storms. ...and what? What are they, what do they look like? So many questions. I searched google and wikipedia and found nothing about these gravity base stations. I have to know! Yes! You describe exactly the kind of creative imagination that I like. The poetry of living machines. The poetry of measuring devices. The romance of "machines wake over us while we sleep".